We’d like to begin this article by saying we will NOT be telling you who has the best pizza in St. Louis. We don’t want to start a full on ‘Pizza War’! Opinions on what makes a good pizza in St. Louis vary as much as the toppings you can put on it. That being said, here are the 4 basics of St. Louis style pizza: thin crust, Provel cheese*, a sweet tomato sauce, and oregano sprinkled on top. There are many variations: types of toppings, cooking style, even how to slice it, but the 4 basics listed above are the usual starting points. So let’s dig in! When people talk about St. Louis style pizza, most people describe the pie from Imo’s. They’re known for the thick layer of Provel cheese, an ultra-thin crust, and square slices…which is why their motto is ‘The Square Beyond Compare’. Ed and Margie Imo began their journey in the pizza biz back in 1964 when they opened their parlor doors at Thurman and Shaw Avenues on The Hill in Saint Louis. The parlor was only open on evenings offering pick-up and delivery. In 9 months, they had opened four locations and now they have expanded to over 90 stores across Illinois and Missouri. We’re not going to be partial to any one pizza place, but since our offices are located right across from Joey B’s on the Landing, we’d be doing a disservice if we didn’t include them! Following in the same tradition as Imo’s and Elicia’s, Joey B’s makes a thin crust with provel cheese and square slices, but they forego the circle shape and opt for a rectangular pizza. Inspired by local family restaurants, Gianino’s and Frankie G’s, Joey B’s has been built on traditional recipes that were handed down from generation to generation. With 25 locations, Cecil Whittaker’s is St. Louis’2nd largest local pizza chain. And with their motto, ‘We didn’t invent thin crust, we just do it better’ they don’t think they’re second to anyone. Started in 1983 in a small restaurant in South County, Cecil Whittaker’s serves Saint Louis style pizza, salads, sandwiches, pasta, and appetizers. They stick to the rules of traditional St. Louis style pizza by using a cracker-thin crust loaded with St. Louis’ own Provel- style cheese. Find Cecil Whittaker’s at cwpizza.com. Our next pizza stop takes us to the east side of the Mississippi River and Peel Wood Fired Pizzas. You don’t have to look very hard to find the secret to Peel. It’s right in the center of their kitchen, visible throughout the restaurant: the oven. Their pizza oven reaches temperatures of about 800 degrees which gives the pies a gently blistered, lightly smoked crust and reduces the fresh mozzarella to molten puddles and makes the pizzas cook in about 90 seconds! Peel offers a pizza for every taste from traditional (pepperoni, sausage) to ‘fancy’ like the Prosciutto pizza that comes topped with dry-cured ham, fingerling potatoes, roasted garlic, fresh rosemary, and Parmesan and fontina cheeses over roasted-garlic olive oil. Plus, they’re not afraid to push the limits with Thai Red Curry or Maple Bourbon Pork pizzas. Pi gained national notoriety in 2009 when President Obama wanted to serve his favorite pizza to friends and staffers and asked the owners of the local pizzeria to fly in to make it. The owner, Chris Sommers flew to the nation’s capital on his own dime to fill the president’s order. This came as a shock to many people as the President is from Chicago which, like St. Louis, is fiercely protective to their pizza claim to fame. While the owners of Pi are quick to point out that they don’t make ‘St. 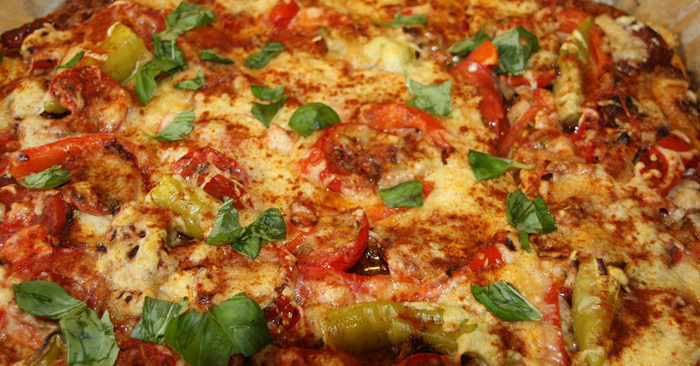 Louis-style’ pizzas, they do make a wide array of thin crust pizzas in addition to their signature cornmeal deep dish pizzas. And yes, the name Pi is definitely a nod to the similarity of the shape of a pizza and the ratio of a circle’s circumference to its diameter (3.14). But, it’s also the area code of St. Louis (314)! Another relative newcomer to the St. Louis pizza scene is Dewey’s. Originally based out of Cincinnati, OH in 1998, Dewey’s now has twenty locations spread between here and Cleveland. Dewey’s prides itself on creative (and delicious) pizzas that feature unique toppings like black bean corn salsa, smoked cheddar cheese, and whole roasted garlic. Their kitchens have huge windows where the kids can watch their pizzas get made from scratch including checking out the hand-tossed dough fly through the air! And the chefs like to have a little fun with the people watching as they’ll occasionally throw a little flour right at the window that can surprise guests that aren’t paying attention. America’s Incredible Pizza Company has been voted the #1 Family Entertainment Center in the World… twice! And your first step into this attraction will tell you why…the wonderful aroma of their gigantic pizza buffet and the sights and sounds of the carnival like atmosphere. This 60,000 square-foot Family Entertainment Center is all indoors and offers seating for hundreds of people with private rooms available for amazing birthday parties, button-down corporate meetings, and other group events. Let’s talk about the food. This isn’t any ordinary pizza buffet where they serve pre-made frozen pizzas with their selection of toppings. If you don’t see your favorite pizza on the buffet, let the chefs know and they’ll cook up a pie with your chosen ingredients. But pizza isn’t the only thing on the menu. They also serve rich macaroni and cheese, crunchy tacos and nachos, hearty soups, fresh salads, mouthwatering desserts, including their World-Famous Cinnamon Rolls. And the food is just the half of it. Their Fairgrounds Game Room includes activities like Laser Tag, Go-Karts, Mini-Bowling and Bumper Cars and over 100 video and skill games. 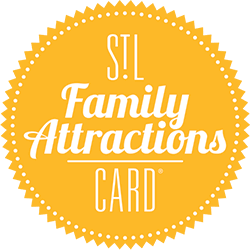 And since America’s Incredible Pizza Company is a partner with the Family Attractions Card, you can take advantage of a great discount: get a FREE coaster ride! Pizza served fresh out of your oven at home is the perfect option for when dining-in at a restaurant doesn’t cut it with your hectic schedule. You’ve got just enough time for a quick Dierbergs run. Take a trip to the frozen aisle and pick up a St. Louis authentic: Lucia’s Pizza! You’ve got your pick of ten different flavorful options at a price your wallet will appreciate. 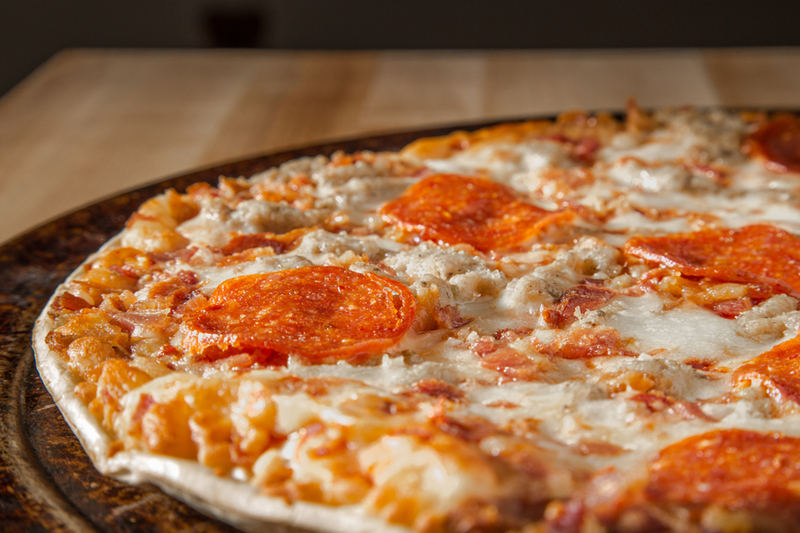 Lucia’s knows how to do justice to that thin crust, topping-heavy, cheesy goodness you love; they’re the oldest St. Louis-style frozen pizza around! And since you’re at home, slice ‘em up and share any way you like. Check out these pies at luciaspizza.com. There are literally hundreds of pizza joints in St. Louis and our list barely scratches the surface. So get out there and find one that fits your tastes! *BTW…What is Provel cheese? 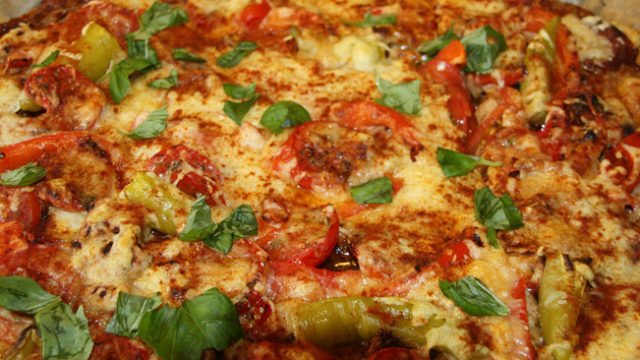 While the official recipes are a closely guarded secret, it is typically a blend of Swiss, provolone, cheddar, and/or mozzarella cheeses that is central to the St. Louis style of pizza.